HRC released the following statement on the victories of HRC-endorsed candidates Tammy Baldwin in the U.S. Senate race in Wisconsin, and Tony Evers capturing the governor’s office. HRC has prioritized investments and organizing in Wisconsin for more than a year, and had 17 staff on the ground in the state as part of the largest grassroots expansion in the organization’s 38-year history. In Wisconsin this year, HRC members and supporters completed over 1,480 volunteer shifts. In the final four days of GOTV alone, our staff and volunteers knocked on over 11,300 doors. Members and supporters also sent over 52,00 text messages to voters in the final weeks with voting resources. Since launching, we've helped over 1,500 Wisconsinites register to vote by mail, online, and at in-person events. HRC hosted 22 Equality Action Academy trainings to give HRC members and supporters the tools they need to take action locally in legislative advocacy and in support of pro-equality candidates. Working with scores of partner organizations, HRC also led field organizing efforts around the state to mobilize voters in support of HRC-backed, pro-equality champions who will fight for LGBTQ rights, and for the rights and welfare of all Wisconsinites. 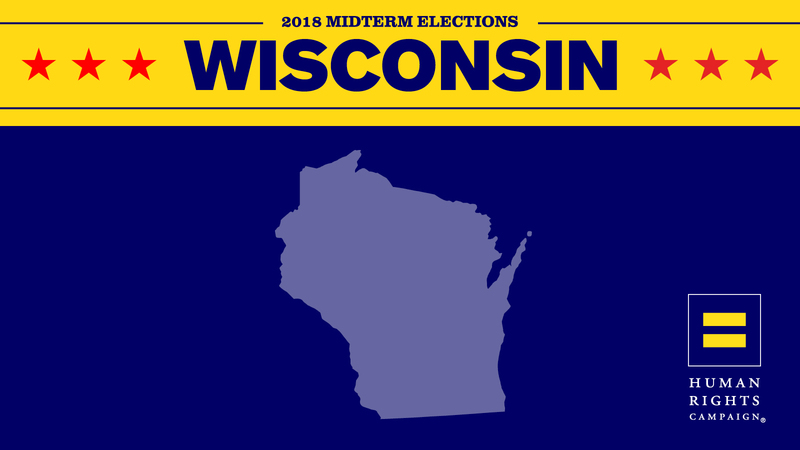 HRC’s Equality Votes PAC ran several ads in Wisconsin, educating voters on Leah Vukmir’s record and why Tammy Baldwin is the clear choice for Wisconsinites. HRC sent over 580,000 pieces of GOTV mail to Equality Voters and reached over 372,000 with our digital advertising campaign generating over 4.9 million impressions. Governor-elect Evers has unseated heniously anti-LGBTQ Governor Scott Walker, whose dangerous record includes supporting Wisconsin’s constitutional amendment banning marriage equality, vetoing a bill to provide domestic partner benefits to workers and attempting to kill a domestic partner registry. He supports banning qualified transgender people from serving in the military, saying he “wouldn’t change” the Trump-Pence administration’s unconstitutional policy. Walker also rejected Medicaid expansion under Obamacare and supported repeal of the entire law, which could have stripped health care from millions of Wisconsinites -- including the 2.4 million Wisconsin residents with a pre-existing condition.